There are some complaints that the taxpayers are not being able to log on to the e-filing website of Income Tax Department or not being able to link Aadhaar with PAN because of different names reflected in PAN and Aadhaar database or etc. While technical snags have been removed already, the main reason for failure of people to log in is because of last minute rush and panic in which those who have already logged in want to continue for the entire period for fear of losing it. For the purpose of e-filing return, it would be sufficient as of now to quote Aadhaar or acknowledgement No. for having applied for Aadhaar in e-filing website. The actual linking of PAN with Aadhaar can be done subsequently, but any time before 31st August, 2018. However, the returns will not be processed until the linkage of Aadhaar with PAN is done. 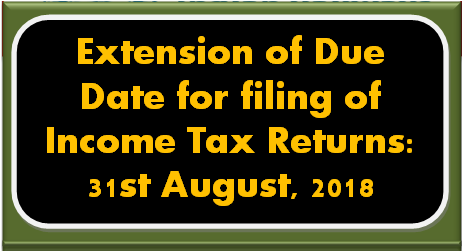 In order to facilitate the e-filing of return, it is also decided to give extension of five days for e-filing of return. 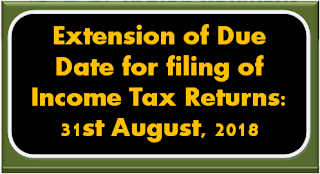 The return can be filed upto 31st August, 2018.